Feb. 6, 2014, 10:33 a.m.
“Attention minutes” combine traditional metrics with measurements aimed at figuring out how much time readers really spend with content. By Caroline O’Donovan @ceodonovan Feb. 6, 2014, 10:33 a.m. The company denies that they’re the main culprit, and some initial research by The Atlantic’s Robinson Meyer suggests that may be true. But now, they’re taking steps toward measuring their performance through something deeper than clicks. This morning, Upworthy announced it would be using a new metric — “attention minutes” — as its primary tool to determine how they’re doing. The goal is to blend traditional eyeball-counting metrics with figures that more accurately measure engagement or how much the audience actually likes the content that they’re making. And they’ll be releasing their source code so other publishers can use it. We love thinking this way because it rewards us for sharing content that people really enjoy and find valuable — not just stuff they click on a lot. It may mean that we don’t do quite as well on uniques or pageviews, but that’s a tradeoff we’re happy to make because this is a metric focused on real user satisfaction. But for all types of newsrooms, developing a more qualitative understanding of audiences will be increasingly important. As publishers continue to invest in longform journalism and experiment with new types of storytelling, questions will naturally arise about the ways in which people actually read and engage with these pieces, beyond the feel-good tally of how many visitors they attract. Some of these signals include the length of time a browser tab has been open, how long a video player has been running, and the movement of the mouse on screen. “This method doesn’t store raw information — it follows a stream of events and every few seconds asks, ‘Is this person still paying attention? '” Pariser said. “If they are, that sends a signal to a data warehouse that says, ‘Chalk up a few more attention seconds for this post. '” Together with other information, including pageviews, Upworthy hopes to get a sense of what content is most delighting and engrossing viewers, not just briefly capturing their attention. Upworthy plans to release the source code “in the coming months.” Pariser says Upworthy has already begun to gather valuable information about how people consume content — like that “the relationship between the length of a video and how much people watch isn’t what we though it would be,” he says. They’ll be publishing more of that information in 2014, too. If you measure performance in pageviews, you encourage slideshows. If you measure performance by social shares, you encourage clickbait headlines and giant Like buttons. Finding a metric that lines up with a publisher’s goals is one of the most important things it can do to encourage better work, and Upworthy thinks this is a step closer to that alignment for their needs. POSTED Feb. 6, 2014, 10:33 a.m.
O'Donovan, Caroline. 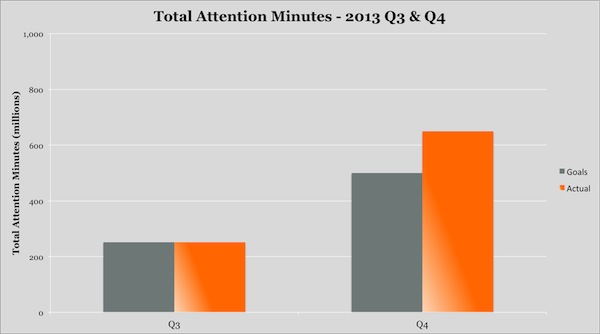 "You won’t believe Upworthy’s new way of measuring audience engagement until you read it." Nieman Journalism Lab. Nieman Foundation for Journalism at Harvard, 6 Feb. 2014. Web. 19 Apr. 2019. O'Donovan, Caroline. 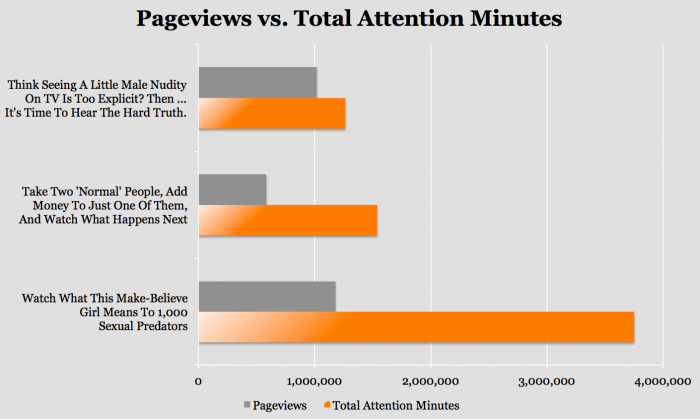 "You won’t believe Upworthy’s new way of measuring audience engagement until you read it." Nieman Journalism Lab. Last modified February 6, 2014. Accessed April 19, 2019. https://www.niemanlab.org/2014/02/upworthy-has-a-new-way-of-measuring-engagement/.